Lexapros and Cons by Aaron Karo. Grades 8+. Farrar, Straus, & Giroux, April 2012. 232 pages. Reviewed from ARC provided by publisher. Chuck Taylor (yes, that's actually his name) knows that the little habits and routines he has aren't just habits and routines. He knows it's crazy to continually check the burners and oven knobs, to get up to pee fifteen times before going to bed, to keep a tally of how many times he masturbates (573 times last year). When Chuck's parents insist that he start seeing a psychiatrist, he's torn between freaking out about seeing a shrink and being grateful that he's finally getting some help. But when Chuck meets new girl Amy Huntington and - miracle of miracles - she actually kinda seems into him, he knows he's got to hide his crazy from her at all costs. It won't be easy, but if Chuck can do it, it just might change his life. Comedian Aaron Karo brings us a fresh, funny male protagonist in a story with as much heart as humor. I'm always looking for more funny teen books. Humor is something that a lot of my teens crave and it can be hard to find funny contemporary titles on the crowded-with-issues-and-paranormal YA shelves. I'm pleased to be able to hand this to teens (especially teen guys) who want a laugh. You can even find humor in the format of the book: chapters are numbered with post-it note tally marks, just like the post-its on which Chuck keeps his jerk-off tally. Chuck Taylor has a great voice and his story is one that teens will identify with. OCD is obviously a major issue in the story, but really Chuck's coming of age and figuring out how to deal with his life. He has a crush on a girl, he has a best friend who's in love with his sister (awkward...), he has parents who are trying their hardest but are still relatively clueless. There's some language and plenty of talk about masturbation, so you need to know your audience with this one. I'd hand it to fans of Carter Finally Gets It by Brent Crawford for the humor and maybe It's Kind of a Funny Story by Ned Vizzini for the psychology aspect. Be sure to read Sarah's review at YA Librarian Tales! 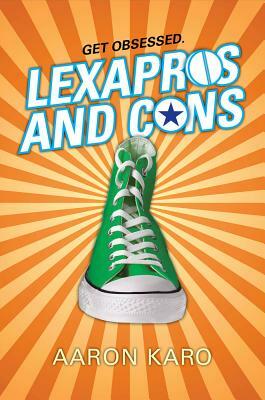 Lexapros and Cons comes out TOMORROW (April 10) and you'll definitely want to check back because I'll have Aaron Karo himself here tomorrow for a guest post you won't want to miss!